David Haire won the Enkalon Trophy for the first time and he did it in style by winning both legs of the event at Bishopscourt on Saturday. 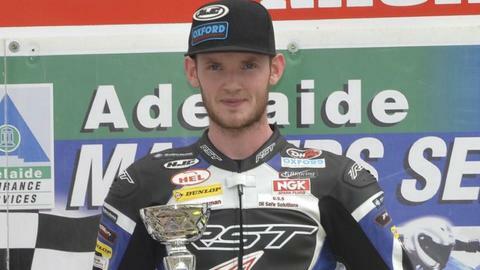 The Lisburn rider won the first Superbike outing from Athlone's Cody Nally, with reigning Irish Superbike champion Nico Mawhinney third. The same three riders finished in the same order in race two. Haire also won the opening 600cc race of the meeting to make it a hat-trick of victories. Carl Phillips came in behind Haire in the first 600cc race and returning Scottish road race star Keith Amor was third. Phillips took the flag in the second Supersport 600 event, with Amor improving to second and Haire having to settle for third on that occasion. Amor won both Supertwins races from his KMR Kawasaki team-mate and team boss Ryan Farquhar. Former British 125cc champion Christian Elkin took the honours in both 125cc races. The Irish championship short circuit action continues at Kirkistown on Easter Monday.